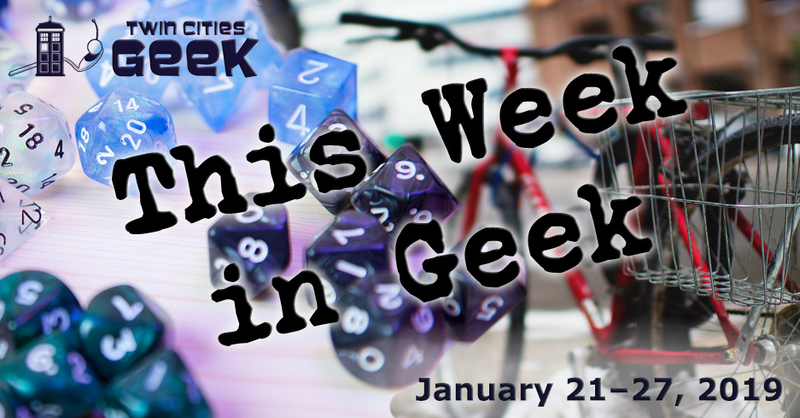 Welcome to This Week in Geek, your guide to events of interest to the Minnesota geek community for the week of Monday, January 21st to Sunday, January 27th. When: Monday, January 21st at 6:30 p.m. When: Tuesday, January 22nd at 5:00 p.m. When: Tuesday, January 22nd at 6:00 p.m. This movie trivia event presented by If I Only Had A Brain Movie Trivia, has moved to Moon Palace Books. This month’s theme is films by the Coen brothers, so expect questions from across their body of work, including favorites like Fargo. Admission is free, and showing up early to grab a coffee or cider at Geek Love Cafe is strongly encouraged. When: Tuesday, January 22ndth at 7:30 p.m.
Come and experience YogaQuest, a blend of yoga and fanfiction storytelling led by certified yoga instructors. Experience a yoga workout experience and a story at the same time. The theme for this week is to be determined, so be ready for anything, and check the Meetup group as the event gets closer. This event costs $15. When: Tuesday, January 22nd at 8:30 p.m.
A cult holiday-horror film will be on display for the price of a dollar at the Alamo Drafthouse this Tuesday. This VHS-horror gorefest from Brazil promises gruesome practical effects and overall strangeness. Check the Drafthouse’s website for other movie events this week, including showings of American Psycho and Babe. When: Wednesday, January 23rd at 7:00 p.m. When: Thursday, January 24th at 6:00 p.m. The Science Museum of Minnesota will be presenting a night straight out of Saint Paul’s torrid, Prohibition-era past with a speakeasy theme. Learn about the science of potent potables with a variety of presenters, including local craft distillery Tatersall Distilling. There will be a variety of activities, including a mystery; check out the website for a full list. Social Science is 21+, with tickets going for $18.95 for nonmembers. When: Thursday, January 24th at 7:00 p.m. This regular event at Clockwerks, hosted by Sam Spadino and Bacon, represents the convergence of two geeky favorites: a brewery decked out in steampunk decor and absurd trivia. Trivia Against Humanity has also expanded and now has weekly events at Mortimer’s and Glam Doll on Tuesdays and other times. See the Trivia Against Humanity Facebook page for additional events. When: Thursday, January 24th at 7:30 p.m.
As an immigrant raised by hard-working Kansans, Superman is an inspiring idea of what the American dream can be, of helping others, and humanity (even in an alien as powerful as a mythological demigod). The Parkway Theater will be presenting a 35-millimeter print of 1978’s Superman, with Christopher Reeve in all his decency. Tickets are $9 in advance. GLITCH will be hosting game designers, writers, artists, and developers from around the Midwest this weekend who will be taking part in the Global Game Jam, and that could include you. This is an intense event where you will work with a team to develop a game in 48 hours. See the website for more schedule-related details, or check out our past article about 2017’s Gamecraft for more info. Tickets for entry are $30 ($25 for students), and all skill levels are welcome. When: Friday, January 25th at 6:00 p.m. When: Friday, January 25th at 7:00 p.m.; Saturday, January 26th at 9:00 p.m.; and Sunday, January 27th at 1:00 p.m. Multiple Maniacs is part of a screening series of early John Waters films put on by the Trylon. Like many of John Waters’ early films, Multiple Maniacs revels in the gruesome. This film focuses on the exploits of a group of murderous carnival performers, and was strongly inspired by the actions of the real-life Manson family. Tickets are $8. When: Friday, January 25th at 8:00 p.m. Witches, wizards, and muggles are all invited to the party of the year: the Minnesota Quidditch Yule Ball. Dance the night away with your wizarding chums, and enjoy Harry Potter cosplay, decorations, refreshments, and merchandise. This event is a fundraiser for the Minnesota Quidditch team, and formal, semiformal, or costume attire is encouraged. Tickets are $35 for couples; $20 for individuals. When: Friday, January 25th at 8:30 p.m. When: Saturday, January 26th at 1:00 p.m. Enjoy a day of community brought on by Anime Twin Cities. This free event will include craft workshops, cosplay, screenings, games, prizes, and more. This is the fifth annual Outpost Anime event, and will be family friendly, so come on down and brave the cold for a day of togetherness in fandom. When: Saturday, January 26th at 7:00 p.m.
Northwest metro sci-fi and fantasy geeks: come on down to the Buffalo Community Center for a casual meetup. The event typically starts off with an informal discussion of games, films, books, TV, and graphic novels before voting on what to watch. This is a very low-key event and is steered by the interests of attendees. When: Saturday, January 26th at 11:59 p.m. When: Sunday, January 27th at 10:15 and 11:15 a.m. When: Sunday, January 27th at 12:00 p.m. When: Sunday, January 27th at 3:00 p.m. Celebrate Japanese New Year traditions in this event from the Japan America Society of Minnesota. This event is all about cultural exchange, including performances, food, and activities for children. There will be Taiko, Koto, ballet, and more to enjoy. Tickets are $13 for nonmembers, but there are a variety of possible discounts; see the event listing for a full rundown on tickets. When: Sunday, January 27th at 5:00 p.m.